On 10th January, Google changed its search engine algorithms in a way that can penalise your website’s SEO if you use newsletter popups. This post summarises the changes, the reasons behind them and what sort of email subscription popups will and won’t harm your SEO. What change is Google making? 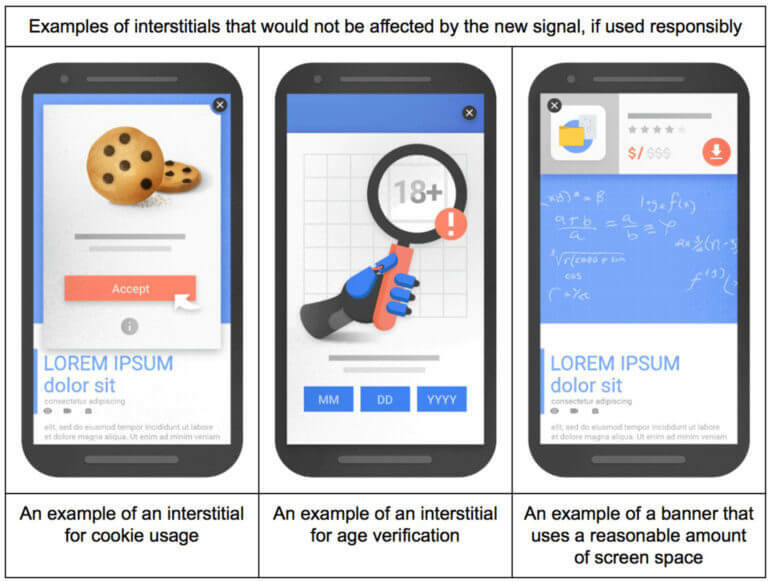 I’m referring to Google’s crack down on “intrusive interstitials”. This isn’t a very user-friendly term – put simply, it refers to popups that appear over the content when you’re trying to view a web page. Popups can be used for many different purposes. However the most common usage – by far – is for email subscription signup forms. You’ll have seen them in action while trying to read blog posts. You get a few seconds into an article (if you’re lucky) and a newsletter popup appears that you have to cancel (or sign up to) before you can continue reading. At the moment, the change only applies to mobile search results. This means that if your responsive website has an email subscription popup, your SEO will only be affected for mobile users. The desktop version of your site will continue appearing for mobile users as usual. This is part of a wider drive to make all websites mobile-responsive. Google announced that they would de-rank sites that aren’t mobile friendly back in 2015. If the mobile version of your website has an email signup popup, you won’t immediately disappear from the mobile search results. This is only one of many factors that Google use to determine where to rank your website. But all else being equal, Google will prioritise websites that don’t have newsletter popups and your SEO could suffer. What’s wrong with email subscription popups? If you have to ask this question then you have a very different mindset to me! I absolutely hate intrusive popups that cover the whole website I’m trying to read. If a popup does this then I will close it and refuse to subscribe on principle. I know people who will immediately leave any website that has a newsletter popup, but I’m not that much of a purist! As a company, for a long time we have refused to add intrusive newsletter signup popups to our clients’ websites. We convince them to build their mailing list using less intrusive means, and everyone has been happy with our recommendations. The same applies to our own website, which has a small popup in the bottom right hand cover. This only appears on bigger screen sizes and is hidden on mobiles, where it would otherwise cover the content. However not everyone is like us. Statistics show that email subscription popups can annoy people and increase your bounce rate, but they do dramatically increase the number of subscribers. This experiment is fairly representative of the studies on this topic. So you’ll annoy some people, but this is countered by the fact that you’re more likely to convert others. I have also seen evidence that people who subscribe via intrusive popups are less likely to be engaged with your communications (e.g. to make a purchase in future) than people who sign up via on-page signup forms. So it’s not clear-cut whether they will help or hinder your website. Google has now forced a decision on the issue by penalising websites with intrusive popups. Personally, I think it’s great. By making this an SEO decision, website owners have a clear incentive to prioritise user experience over newsletter signups. The change currently only affects the mobile search results because Google believes that the problem with popups is worse for mobile users due to the small screen size. Have you ever felt frustrated at having to tap a tiny cross in the corner of a popup on your mobile? That’s the reason for the change. However email subscription popups damage user experience on all screen sizes by distracting visitors and demanding attention. For this reason, I expect that Google will roll out this change to desktop search in future too. What type of newsletter popups will harm my SEO? As you can see, all these popups cover significant portions of the mobile screen. They literally prevent you from continuing what you were doing until you either sign up or cancel the popup. These are the most annoying types of email subscription popup and Google is quite right to focus on these. Does the penalty only apply to popups that appear when the page first loads? Surprisingly, no. When I first heard about the change, I assumed that Google would only penalise sites with popups that appear before you can see the page content. This would fit with how search engines usually crawl pages, as they read all the HTML for the page as soon as it loads. Google has confirmed that the SEO penalty also applies to popups that appear while the user is reading through the page. This is common practice for newsletter popups – they often appear after 10 seconds or so, or when you hover over the button to close the tab. However, the change doesn’t apply to popups on subsequent pages that you visit. So if you click from the mobile search results to a specific web page then any intrusive popups on that page will count. But if you then click to another page then any popups on the subsequent page don’t count. If you really need popups on your website, it would be worth removing them from your main landing pages and continuing to use them elsewhere on your site (e.g. after a ‘Read More’ link on a page that people rarely access directly). Are ANY types of popup ok? Popups that meet a legal obligation, e.g. cookie acceptance or age verification. Popup login forms that give the user access to hidden content which can’t be crawled by search engines. Banners that use a reasonable amount of space and are easy to cancel. Only the 3rd example applies to email subscription popups. Can I still have a newsletter popup form? If you want a popup newsletter signup form on your website, read the guidance carefully and plan the best way to achieve this without harming your SEO (or user experience). If you definitely want a newsletter popup, keep it as small as possible. Use the 3rd example above as a guide on the maximum proportion of the screen it should cover on mobiles. Or even better, hide it on mobiles completely (as we have done with the popup on this site). Test the cancel button (or X icon in the corner) on a smartphone. Can people with large fingers easily dismiss the popup? Try on-page newsletter signup forms. Add a signup form to your sidebar or embed it part-way through the page, with some text highlighting the benefits of signing up. Monitor your subscription rates and see if it really makes a difference. Try adding a notice to the top of the page. There are ways to capture your visitors’ attention without using popups. Some websites add a noticeable but less intrusive banner to the top of the page, above the page content. This captures people’s attention without annoying them by hiding the content they’re trying to see. I recommend the BugMeBar WordPress plugin which has lots of options for creating eye-catching banners. 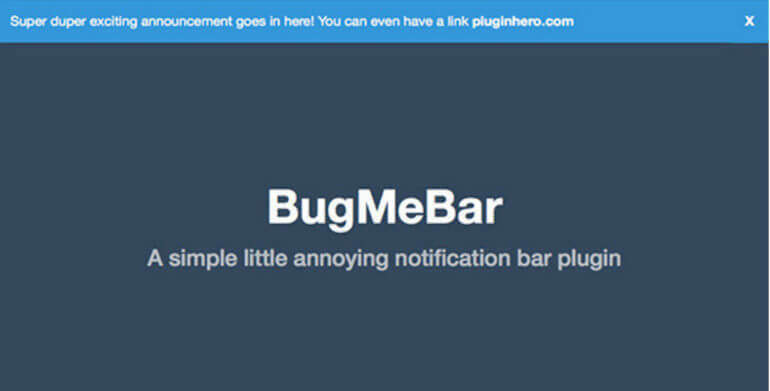 It describes itself as annoying but is far less annoying than popups – a good compromise! We find that it makes sense to use a bar for announcements, and a small corner popup for newsletter signups. Check out the best examples of popups for inspiration. You don’t need to invent the best ideas for exit intent popups, everything is already on the internet and you can read about the best practices and implement this advice on your own site. Check out this exit intent popup gallery. Finally, let’s talk about alternatives to a newsletter popup. The simplest option is to add a normal signup form directly to a page or sidebar area. 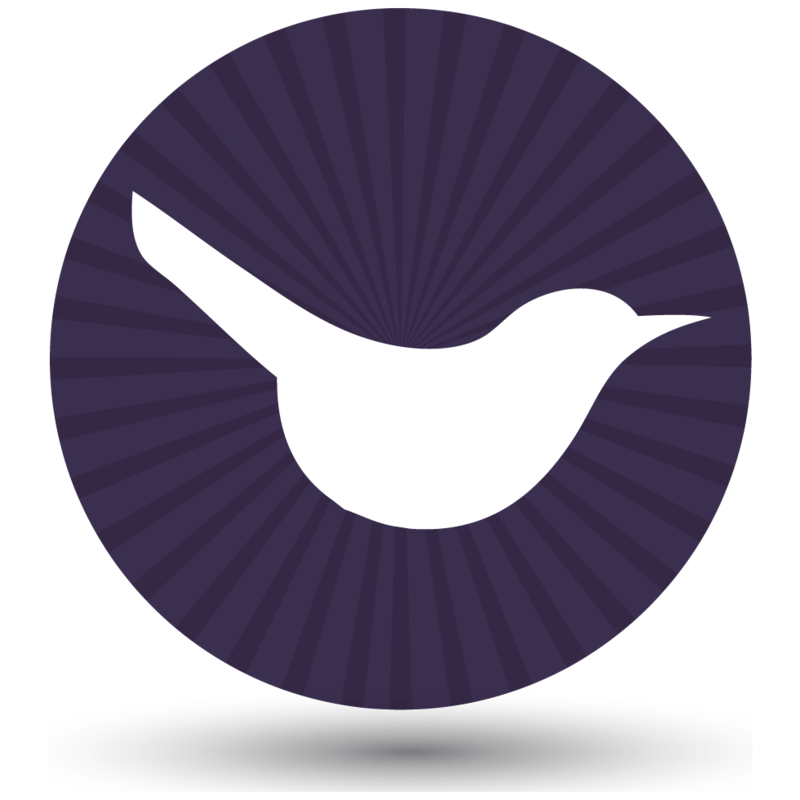 You can even add the form within the body of a blog post, so that people can’t possible miss it. Once you’ve sorted out your newsletter popups and signup forms, it’s worth spending some time ensuring your website is really mobile friendly. This will help your SEO. To further boost your SEO, check out our SEO services for WordPress websites or our tips for a perfect WordPress mobile site. Oh, the irony of the crappy newsletter popup that appears within seconds on this very page. The main conclusions I have reached over the years are that 1) Marketers are dumb. 2) And greedy. A poor combination if you want to be successful. Hi Rachel, I do understand the irony! We thought long and hard about the best way to increase signups, given our hatred of popups and Google's algorithm changes. We were firmly against adding a popup that fills the screen, or an exit intent popup that appears when you try to close the website. As a compromise, we are trialling a more subtle box that only appears in the bottom right corner. This doesn't fall under the Google changes mentioned in this article because it only appears on larger screen sizes, and not mobiles - and it doesn't prevent you from viewing the page content. However, I agree that it's a controversial issue and we are still waiting to see how the trial goes before deciding whether to keep it longer-term.